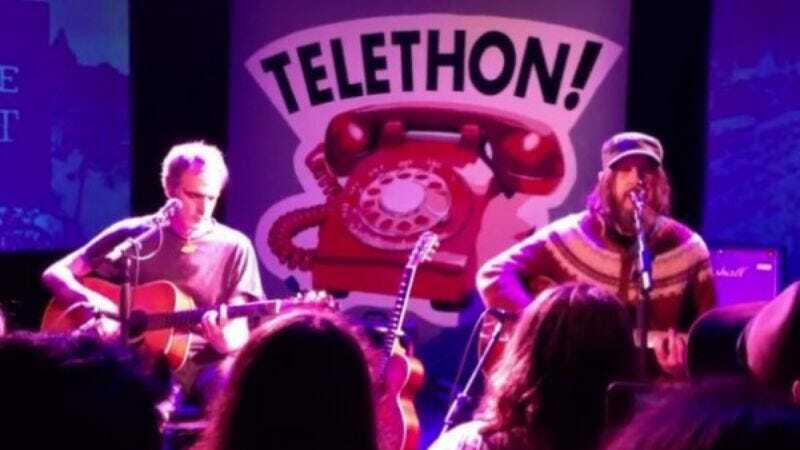 Last night’s Strike Debt benefit featured a ton of reputable performers, including everyone from Janeane Garofalo to TV On The Radio’s Tunde Adebimpe and Kyp Malone, but what the Internet’s buzzing about today is a performance by Neutral Milk Hotel’s Jeff Mangum and Fugazi’s Guy Picciotto. The duo played the protest song “Sign The Dotted Line” by New Zealand punk band Tall Dwarfs and fortunately someone—probably a Mangum fan because those people are nuts—was there to capture the whole thing on video. It’s worth noting that the benefit was a success and Strike Debt met its goal of raising $250,000. As of this afternoon, the organization had actually raised nearly $300,000 and is still taking donations at its site.